^ Wicker, Nancy (1998). Hallsal, Guy (ed.). Selective female infanticide as partial explanation for dearth of women in Viking Age Scandinavia. Woodbridge: Boydell press. pp. 205–21. ISBN 978-0-85115-713-9. ^ "The Vikings 787 AD-1066 AD (Anglo Saxon Britain)". Ports & ships. ^ Farkas, Alexandra; Szaz, Denes; Egri, Adam; Blahó, Miklós; Barta, András; Tarczay-Nehéz, Dóra; Bernáth, Balázs; Horváth, Gábor (30 June 2014). "Accuracy of sun localization in the second step of sky-polarimetric Viking navigation for north determination: A planetarium experiment". Journal of the Optical Society of America A. 31 (7): 1645–56. doi:10.1364/JOSAA.31.001645. PMID 25121454. Björn Ironside (Old Norse: Bjǫrn Járnsíða, Icelandic: Björn Járnsíða, Swedish: Björn Järnsida, Danish: Bjørn Jernside; Medieval Latin: Bier Costae ferreae) was a historical Norse, Swedish Viking chief who also figures in late sources as a son of Ragnar Lodbrok and a legendary king of Sweden. He lived in the 9th century, being securely dated between 855 and 858. Björn Ironside is said to have been the first ruler of the Swedish Munsö dynasty. In the early 18th century, a barrow on the island of Munsö was claimed by antiquarians to be Björn Järnsidas hög or Björn Ironside's barrow.Medieval sources refer to Björn Ironside's potential sons and grandsons, including Erik Björnsson and Björn at Haugi. His descendants in the male line supposedly ruled over the Swedes until c. 1060. Fornsigtuna (forn means ancient), Old Sigtuna, Sithun, Sign(h)ildsberg or Signesberg (59°37′N 17°39′E) is located in the parish of Håtuna approximately 4 kilometres (2.5 mi) west of the modern town of Sigtuna, by Lake Mälaren in Sweden. Although the location is nearly forgotten, it has a central role in Norse mythology. Jarlshof ( YARLZ-hof) is the best known prehistoric archaeological site in Shetland, Scotland. It lies near the southern tip of the Shetland Mainland and has been described as "one of the most remarkable archaeological sites ever excavated in the British Isles". It contains remains dating from 2500 BC up to the 17th century AD. the largest such site visible anywhere in Britain and include a longhouse; excavations provided numerous tools and a detailed insight into life in Shetland at this time. The most visible structures on the site are the walls of the Scottish period fortified manor house, which inspired the name "Jarlshof" that first appears in an 1821 novel by Walter Scott. The site is in the care of Historic Scotland and is open from April to September. In 2010 "The Crucible of Iron Age Shetland" including Mousa, Old Scatness and Jarlshof was added to those seeking to be on the "tentative list" of World Heritage Sites. The Norse–Gaels (Old Irish: Gall-Goídil; Irish: Gall-Ghaeil; Scottish Gaelic: Gall-Ghàidheil, 'foreigner-Gaels') were a people of mixed Gaelic and Norse ancestry and culture. They emerged in the Viking Age, when Vikings who settled in Ireland and in Scotland adopted Gaelic culture and intermarried with Gaels. 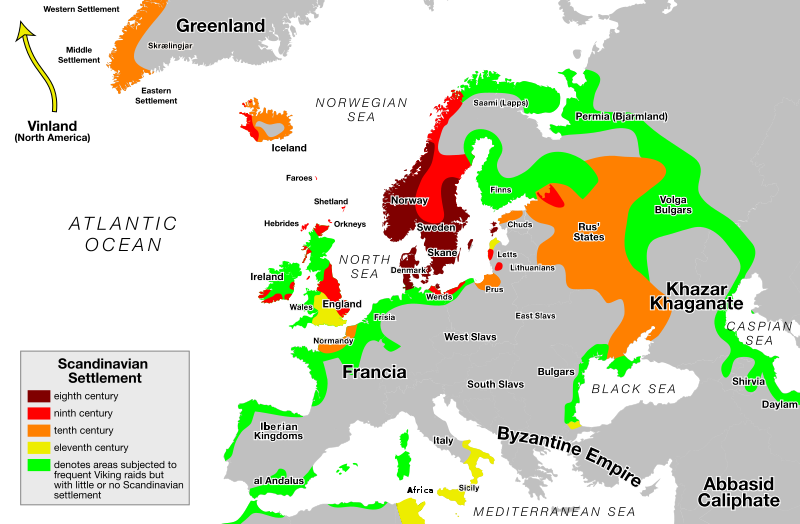 The Norse–Gaels dominated much of the Irish Sea and Scottish Sea regions from the 9th to 12th centuries. They founded the Kingdom of the Isles (which included the Hebrides and the Isle of Man), the Kingdom of Dublin, the Lordship of Galloway (which is named after them), and ruled the Kingdom of York for a time. The most powerful Norse–Gaelic dynasty were the Uí Ímair or House of Ivar. Over time, the Norse–Gaels became ever more Gaelicized and disappeared as a distinct group. However, they left a lasting influence, especially in the Isle of Man and Outer Hebrides, where most placenames are of Norse–Gaelic origin. Several Scottish clans have Norse–Gaelic roots, such as Clan MacDonald, Clan MacDougall, Clan Ruaidhrí, Clan Morrison and Clan MacLeod. The elite mercenary warriors known as the gallowglass (gallóglaigh) emerged from these Norse–Gaelic clans and became an important part of Irish warfare. The Viking longship also influenced the Gaelic birlinn or longa fada, which were used extensively until the 17th century. Norse–Gaelic surnames survive today and include MacIvor, MacAskill, MacAuley, (Mac)Cotter, and Lawley. Old Scatness is an archeological site in the parish of Dunrossness in the South Mainland of Shetland, near Sumburgh Airport consisting of mediaeval, Viking, Pictish, and Iron Age remains. It has been a settlement for thousands of years, each new generation adding buildings, and leveling off old ones. Among the discoveries is an Iron Age broch. The most prevalent metre of skaldic poetry is dróttkvætt. The subject is usually historical and encomiastic, detailing the deeds of the skald's patron. There is no evidence that the skalds employed musical instruments, but some speculate that they may have accompanied their verses with the harp or lyre.The technical demands of the skaldic form were equal to the complicated verse forms mastered by the Welsh bards and Gaelic (in both Scotland and Ireland) ollams. Like those poets, much skaldic verse consisted of panegyrics to kings and aristocrats or memorials and testimonials to their battles. According to custom, all free Norse men were required to own weapons, as well as permitted to carry them at all times. Indeed, the Hávamál, purported to be sage advice given by Odin, states "Don't leave your weapons lying about behind your back in a field; you never know when you may need all of sudden your spear. "As war was the most prestigious activity in Viking Age Scandinavia, beautifully finished weapons were an important way for a warrior to display his wealth and status. A wealthy Viking would likely have a complete ensemble of a spear, a wooden shield, and either a battle axe or a sword. The very richest might have a helmet; other armour is thought to have been limited to the nobility and their professional warriors. The average farmer was likely limited to a spear, shield, and perhaps a common axe or a large knife or seax. Some would also bring their hunting bows (mostly long bow or flat bow) to use in the opening stages of battle. Viking art, also known commonly as Norse art, is a term widely accepted for the art of Scandinavian Norsemen and Viking settlements further afield—particularly in the British Isles and Iceland—during the Viking Age of the 8th-11th centuries CE. Viking art has many design elements in common with Celtic, Germanic, the later Romanesque and Eastern European art, sharing many influences with each of these traditions.Generally speaking, the current knowledge of Viking art relies heavily upon more durable objects of metal and stone; wood, bone, ivory and textiles are more rarely preserved; human skin, which historical sources indicate was often elaborately tattooed, is nowhere extant and is unlikely to have survived. The artistic record therefore, as it has survived to the present day, remains significantly incomplete. Ongoing archaeological excavation and opportunistic finds, of course, may improve this situation in the future, as indeed they have in the recent past.